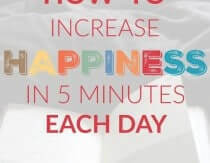 Heather Dessinger 55 Comments This post contains affiliate links. Years ago, when I misplaced my regular moisturizer in a move, I discovered by happy accident that tallow is uniquely compatible with our skin’s biology, leaving it supple and nourished after use. Rich in fat soluble vitamins A, D, and K along with a saturated fat ratio that closely resembles what our cells use to maintain integrity, it absorbs easily without leaving a greasy residue behind. 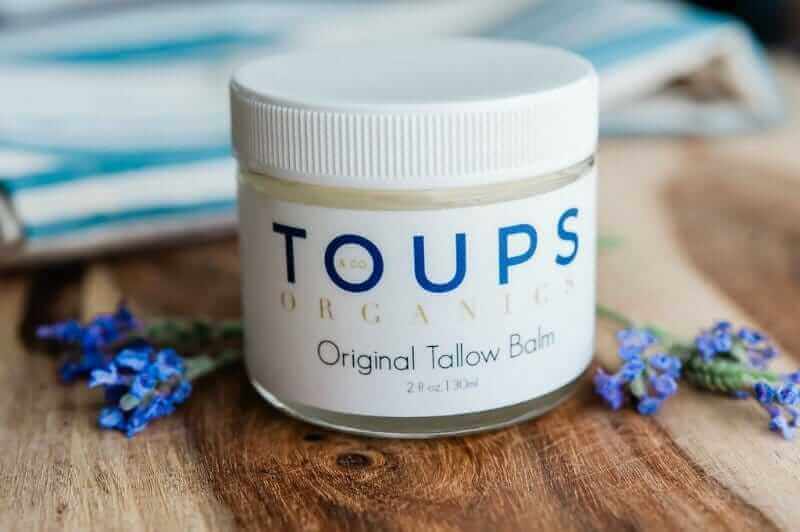 I’ve used this tallow balm for dry/chapped skin, diaper rash, and sunburns, and many of my friends swear by it for soothing eczema. But don’t think of it just as a “boo boo” balm – it makes an amazing daily moisturizer for the face and body. You can also slather it on your feet and throw some socks on for an intensive moisture treatment. If you have tallow on hand – either homemade or purchased – it’s super easy to make. However, if you don’t have easy access to tallow or are short on time, my friend Emilie sells pre-made tallow balm blends that smell amazing. Although I love to make my own so that I can customize my essential oil blend, there are times when I’ve got too much going on and order from her instead. 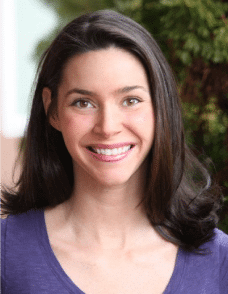 She’s carefully formulated the essential oils in each balm to be safe for use on the face and with children. If you want to try it out, click here and use MOMMYPOTAMUS at checkout for 10% off your first order. Wondering what essential oils to use? Two pre-made blends that would also work beautifully are Anti-Age (which smells amazing) and Soft Skin. Note: The essential oils marked with an asterisk (*) should be avoided if pregnant or nursing. For a longer list of essential oils to avoid during pregnancy/breastfeeding click here, and for a list of oils that are considered safe for pregnancy/nursing click here. 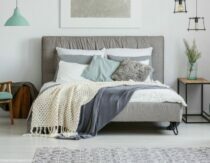 What type of tallow is best? Tallow obtained by scooping the fat off the top of a chilled container of beef broth will likely have more moisture than traditionally rendered tallow. For that reason it tends to go bad quickly. Stick with the traditional process and your finished product should last about a year at room temperature. Makes approximately 1/2 cup – I fill a 4 ounce jelly jar to the brim when I make a batch. 27 drops essential oil for face application, or up to 54 drops for body application – optional, see suggestions in the post above. 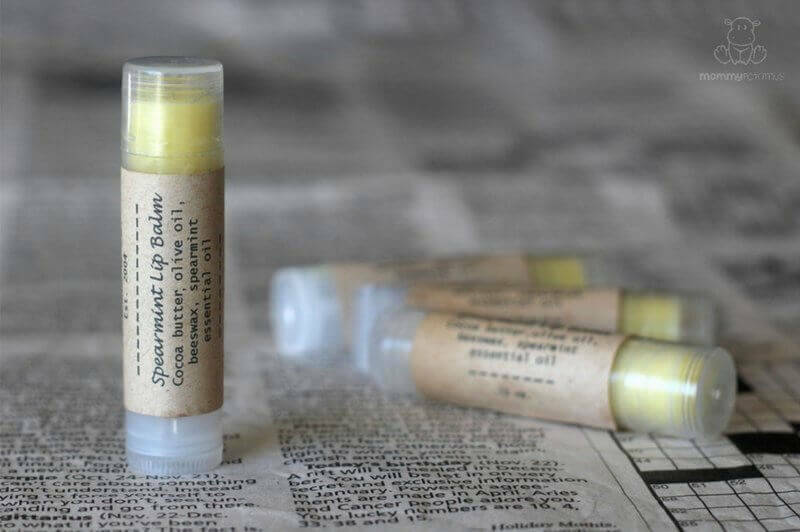 If you’re making this balm as a natural diaper balm for babies under two, use up to 8 drops of a child-safe essential oil. Melt the tallow gently over low heat, then pour into a large bowl and mix in the olive oil and essential oils. Allow to cool for about an hour, then whip with a hand mixer until it looks like frosting. Whipping gives it a lighter consistency that makes application easier. Place in a clean jar and use as needed. Shelf life is about one year. I am loving my tallow balm, though I haven’t tried whipping it yet. I use a combination of lavender, geranium and vetiver in mine. It smells SO good! I was thrilled to find something to do with the tallow I rendered when we butchered that is so simple! I had planned on making soap but just haven’t worked myself up to that yet. Thank you for the recipe! I have made tallow balm twice but each time it’s not quite right. I think I haven’t been using enough olive oil. Also, I bought crunchy balm original, sweet girl scent, and frankincense a few months ago and I love it. I’m almost out of the frankincense balm so I need to order more. I make tallow balm too, but didn’t think of whipping it. I will next time around. Love your site. Thank you for all you do. Love tallow balm. It is amazing for your feet. I’ve made my own but never thought of whipping it. You definitely need some essential oils otherwise you kind of smell like meat ? I know! I was going to make my husband put it on too, so I wouldn’t be the only one smelling like a pot roast in bed. Being pregnant, and still queezy at some smells, I wasn’t feeling it! I will be making this! I love tallow balm! Tallow is one of my favorite oils and I use it in everything from soap to solid lotion bars to deodorant. 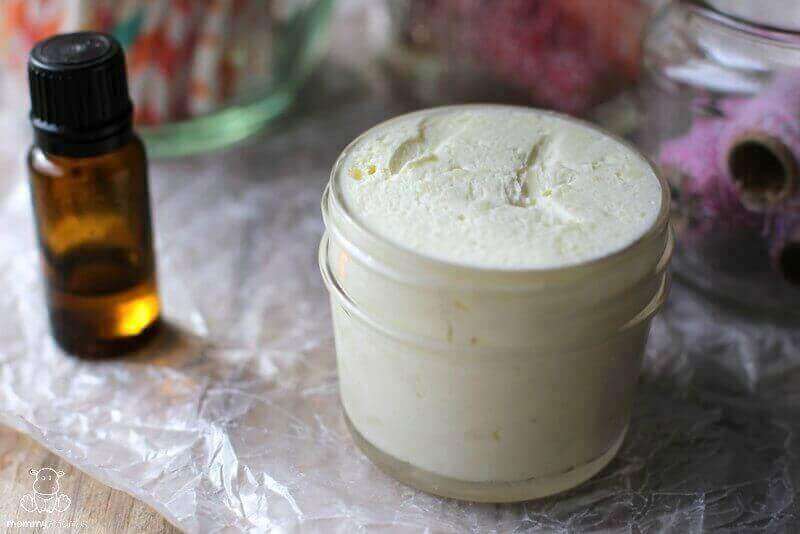 However, I usually use tallow, shea butter coconut oil and olive oil when making whipped butter; but I would love a softer balm for the winter. I made this last night! The consistency is absolutely perfect. Thick and creamy glides in smooth and is NOT greasy! I love it. Kristen, would you share your recipe? Which of the crunchy balms would you recommend for “older” skin? I sent them an email asking for advice and have not heard back. Would like to order some and was just wondering if one is better than another. After reading this article, I immediately placed on order with Crunchy Balm (using your promo code, thank you!) and tried it last night on the eczema on my arms and this morning woke up with it smooth as ever! It’s not completely gone, of course it takes some time.. but I was so happy to see progress! I use Vintage Tradition which you recommended some time ago. This sounds great. 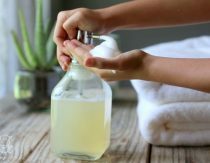 I can’t wait to make it, but which essential oils would you recommend for my daughter who has eczema? Thank you! Awesome recipe! I’m gonna try it when I can, I love these DIY solutions. Thanks! Thank you for this recipe, I can’t wait to try making it! However, I can’t easily find beef tallow where I live and I’m not willing to devote the little time I spend at home to rendering fat. The butcher I go to makes lard from pastured pigs. Can I use that instead or is it somewhat less optimal than beef tallow? Thank you in advance for your response. Hi Heather! I recently purchased your DIY Organic Beauty e-book, and I am loving it so far, still a lot to explore! I just made tallow using your recipe to render tallow. I am about to make this lotion as well, but I wanted to ask you regarding aging skin. I am 45 years old and I am noticing lines around my eyes and mouth area. What essential oils would you recommend for that? I also notice the elasticity of my skin is not what it used to be! Is there anything you would recommend for that? Is Collagen Protein something I need to look into? I truly appreciate the wealth of knowledge you bring in every one of your recipes. 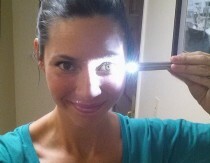 The knowledge I have acquired from your blog is so powerful and essential to my family’s overall health. Thank you!! 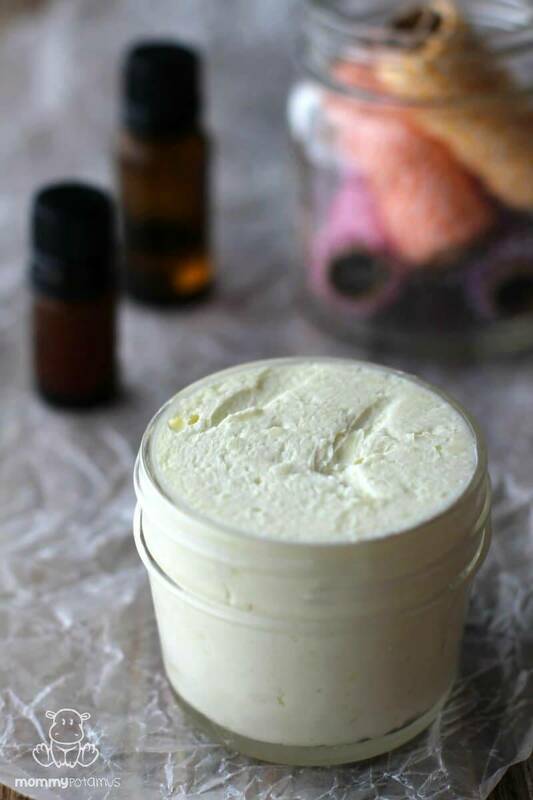 Have you tried making multiple jars of the whipped balm? I am wondering if I can make several jars and freeze the extras. Will the consistency still be nice? I am trying to minimize clean up. I just rendered 11 pounds of tallow over the weekend. It is a simple process, but cleaning up is a pain! How DO you clean up after making this?! Need some ideas. Can I put it through my dishwasher? So so messy. Could I substitute Olive oil for apricot kernel oil in this recipe? Yes, but I believe apricot oil has a shorter shelf life than olive so it may shorten the overall shelf life. If you add some pure Vitamin E to your recipes it will act as a natural preservative. Depending on how much you use, it should extend the life of your product by months. There are other organic plant-based ingredients that can be used as preservatives but I prefer Vitamin E.
If you make more than one batch of the tallow balm, refrigeration, not freezing, is usually considered the best method of extending their life. I’ve read on many sites like Brambleberry that Vitamin E is not considered a preservative but can slow down oil based ingredients from growing rancid which I think would definitely add to the shelf life of this product. can you replace the olive oil with coconut oil? how can you find tallow where the beef was not given antibiotics? Organic tallow is widely available online. I order mine from etsy. I know this was some time ago now, but just wondering if you did make a batch using Coconut Oil instead of Olive Oil? I rendered some tallow this summer, but the beef smell is overwhelming. How do you get the beef smell out? The essential oils do not mask it. Try using veal tallow next time if you can find some. The “beefy” smell is much milder. 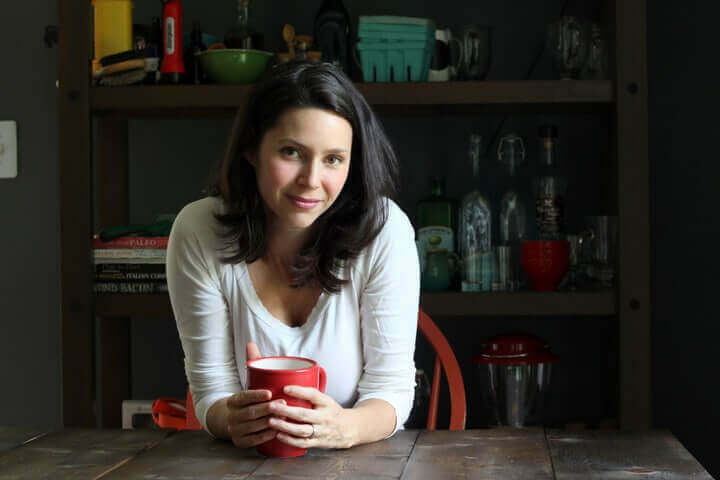 I saw your note that the fat from bone broth will go bad more quickly? I’m wondering if you know how long it approximately lasts. I’m hoping to find ways to save the fat from my bone broth. Heather, would you ever use sea buckthorn oil in this? I heard that is really super for skin regeneration, is that right? And I was under the impression that once the fat was rendered, tallow doesn’t have the beefy smell any longer, was I mistaken? I LOVE the idea of this and cannot wait to make it! I’m gonna try this weekend. I’ve been making tallow balm with deer tallow for the past couple of years, and refer to this recipe each time. My wife and daughters love it. Several people above have commented on the smell of tallow. When I render tallow, I use a large pot of water, and boil the fat for at least 30 minutes. Then I put the pot outside to cool until the fat on top of the water has solidified. I repeat this process, with fresh water, as many times as needed (usually 3) until I have pure white tallow without any unpleasant odor. I hope this helps. Thanks for the recipe Mommypotamus! I’ve been rendering tallow for years for skin care — this comment is mind-blowing! I must try this! Thank you, Jim, for sharing! Have any of you on here who make your own ever used sheep tallow? are other oils interchangeable with the olive oil? I’m thinking of replacing the olive oil with jojoba oil. Yes, you can use other oils although they have different properties that may change the final product somewhat. Hi, thanks so much for this recipe. I made it using light olive oil. It is somewhat greasy so I am using it as a night cream. Perhaps the olive oil I am using causes it to be “greasy”. My Tbsp measure is 20 ml, and it looks like a large measure. I render my own tallow from suet. I will have to try the boiling trick to clean it thoroughly, although I love the musky smell of tallow! How much does this make exactly? Would it fill multiple 4oz jars? Has anyone tried mutton tallow? Any difference? Preference? Is olive oil non comedogenic? I’ve never used olive oil on my face as I’m prone to acne and have never tried it. I have tried tallow (alone), argan oil, rosehip oil and jojoba oil on my face with no issues. Could I mix argan oil in the recipe instead of olive oil? Has anyone used castor oil instead of olive? Success? TIA for your response. May I have the amounts you used for yours please? Melissa, I’m not sure what you’re asking. Can you please rephrase your question? Would castor or argan or jojoba work instead of olive oil for acne prone skin? Hi would avacado oil be used instead if olive oil? Hi Heather! Thank you so much for posting this. My 1yr old has mild-medium degree eczema (never has gotten to the point of an open wound, except when she occasionally scratches too hard). We tried basic oils first, and a minimal/natural ingredient concoction that worked decently second, then Foderma (a fan favorite) which claims to be natural but still contains some questionable ingredients (and comes at a steep cost for a minimal amount). ANYWAY, looking at Fodermas ingredients, I thought I might attempt to make a simpler tallow-based version if it with similar active ingredients. Arnica oil was listed as one of those ingredients – have you ever made an skin care/balm with Arnica oil? Ivy extract was another, which I thought was for coughs (and unsafe for babies?). I only plan to use ingredients that I have a pretty solid confidence in being safe for babes. Thanks again for the recipe (and research/info)! Hi Lucy, yes I have a tutorial for infusing arnica oil at the bottom of this post. Prev Post Can Orange Glasses Really Help You Sleep Better?